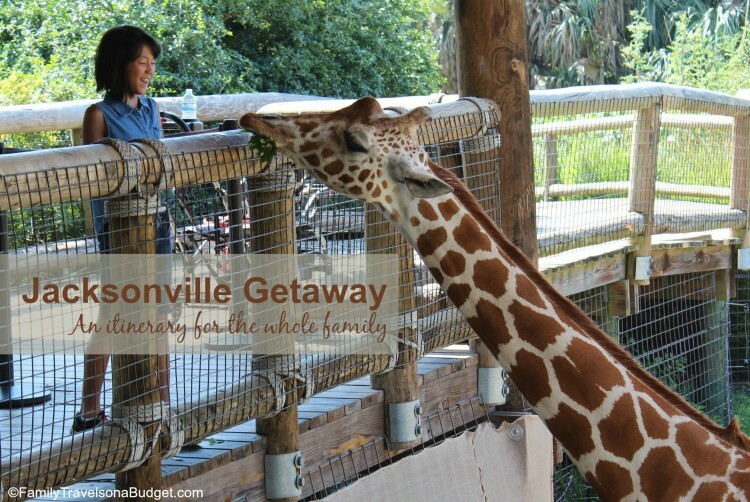 Home » Destinations » USA » Florida » Jacksonville Getaway: A fun family weekend! Jacksonville, Florida is home to more than just the Jaguars and bridges. This city and its nearby Atlantic coast beaches has everything a family could want for a great weekend getaway. The big draw inspiring a Jacksonville getaway might be its 4.1 miles of beaches. With free parking, plentiful oceanfront restaurants and the Jacksonville Beach Fishing Pier, it makes sense to spend a day here. To learn more about the beaches, access points and bathrooms, click here. Beyond the beach, spend a fun-filled day at Adventure Landing’s Shipwreck Island Waterpark. The Jacksonville Visitor’s Bureau invited Ellie and me to spend an afternoon here, and we loved it! I appreciated the courteous and professional lifeguards (they say, “Yes, ma’am.” and “My pleasure.”). I also appreciated the park’s cleanliness. We had water shoes, but decided to leave them with our towels since the place was so clean. Ellie, of course, thought the water slides were amazing! We rode “The Rage,” which sends you UP and down hill, five times! The waterpark has a small splash pad area for tiny park-goers. The pirate area has slides for little kids through adults, though it’s geared for the younger elementary set. The four big slides and the wave pool are great for elementary (kids 42 inches or more) through adult. Take a break from the water to play putt-putt or enjoy the indoor arcade. Each activity has a separate admission fee. 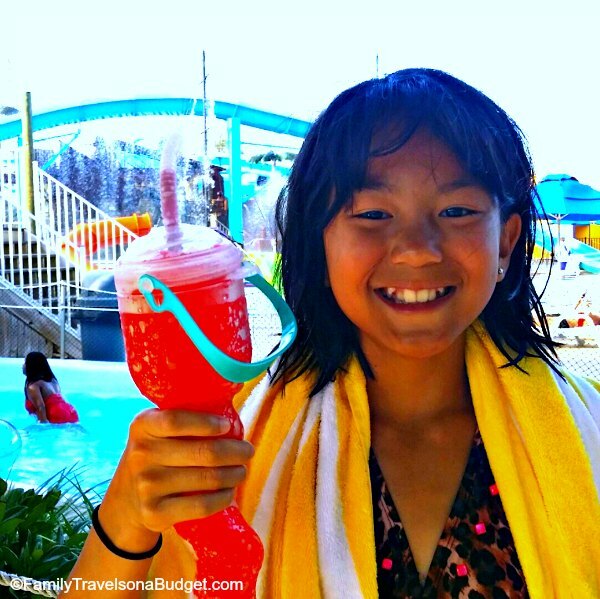 Budget tip: A number of area hotels partner with Adventure Landing to offer discount tickets or free admission with a hotel stay, making a visit even more budget-friendly. 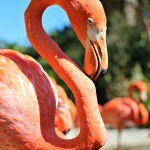 The highlight of our Jacksonville getaway was the Jacksonville Zoo and Gardens. Like many zoos across the country, the Jacksonville Zoo is also home to the area’s botanic garden. What makes Jacksonville stand out, though, is how the gardens are mingled in with the animal exhibits. The zoo rivals Disney’s parks with its attention to detail. My favorite was the Asian Garden, and Ellie’s was the butterfly garden near the Trout River. Of course, the Jacksonville Zoo has animals too! Ellie’s favorite activity was petting the stingrays in Stingray Bay. She laughed as the giant otters (they’re huge) pirouetted through the water. 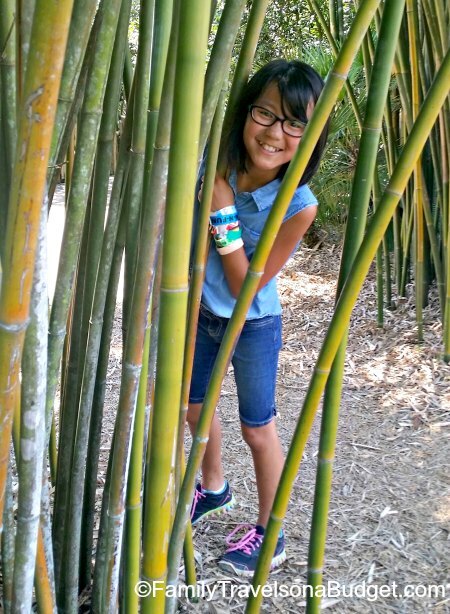 She also loved seeing the animals in the Land of the Tiger exhibit, particularly the tiny Asian small-clawed otters. For me, the Land of the Tiger exhibit was the standout. I get to visit zoos across the country, but have never seen an exhibit like this. Picture a tiger-sized “habi-trail” (think hamster trail tubes only super-mega-giant-sized) to explore. The five tigers who call the Jacksonville Zoo home are free to roam through their habi-trail from one end of the exhibit to the other, about 2.5 acres. Their “tunnels” give them a chance to roam their territory much like they would in the wild. There’s no running in circles in a half-acre parcel here. The zoo staff explained that the entire exhibit was designed to give the tigers the most natural experience possible, while allowing the zoo’s visitors a chance to see them. We got to see a tiger sleeping in a tube above our heads. The zoo included an air-conditioned area for zoo guests to watch the tigers through large glass windows. They also do tiger training here, where guests can watch and learn what the animal caregivers do and why. Other guest activities include feeding the giraffes, attending keeper talks (like the tiger one), riding the train and carousel, or kayaking on the Trout River to get close to the marine animals who live nearby. Some activities require an additional fee. You can click here for current admission prices and park hours. The zoo is a not-for-profit organization. Ticket sales support the zoo directly, and a portion of the proceeds fund conservation efforts around the world. Budget tip: The zoo is a reciprocal member of the AZA reciprocal zoos list, offering free admission to members of reciprocal zoos. The zoo is suitable for all ages. TacoLu at 1712 Beach Blvd., next to Adventure Landing. Tacos are priced at $2.99 to $4.99 each, so the price is family friendly too. I recommend the Brisket and the Carnitas (each is $2.99). Arrive early and expect a wait. It’s worth it, though! Maple Street Biscuit Company (multiple locations). This breakfast/lunch restaurant won a TripAdvisor Certificate of Excellence. Locals and tourists alike love the food, all built around the humble southern biscuit. It tends to be crowded and noisy, so if you’re a coffee drinker like me, enjoy that needed cup at the hotel before you venture out ~ just in case there’s a wait! For sweets and treats (our favorite!) head to Sweet Pete’s in downtown Jacksonville. Warning, it’s pricey, though upstairs offers bulk candy which is a little easier on the wallet. Ellie and I had fun here, getting sour candy for her brothers and their signature salted caramels for her dad. It’s an adorable place to visit, enjoy a scoop of ice cream and get a treat for the trip home! There is no onsite parking, but nearby meters are only 25 cents/half-hour. During football season, catch the Jacksonville Jaguars (NFL) play at EverBank Field. Explore the many parks throughout downtown Jacksonville or go kayaking or paddle boarding (SUP). Enjoy a budget-friendly family getaway in November, when kids’ admission is free to many attractions including the zoo, the science center and the World Golf Hall of Fame (and more!). 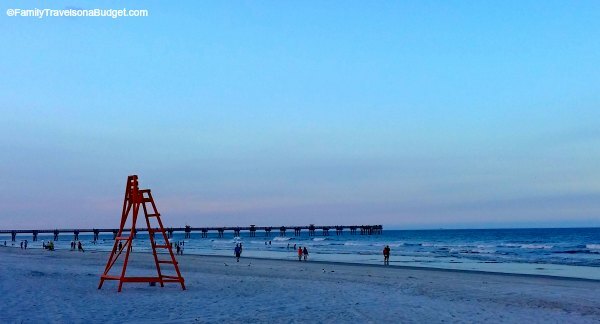 Instead of passing through on your way to theme parks, plan a Jacksonville getaway instead! 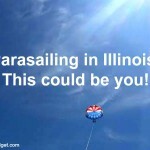 I think you’ll be surprised at how much there is to see and do… and how affordable it is, too! Florida is on our list the next time we visit America! Thank you for the family travel tips! Kero, I hope you’ll visit more than the theme parks when you’re in Florida. Disney is great, but the state is rich in history and culture and beaches. I hope you get to see a lot of it! It’s a great vacation destination! The new zoo exhibits are incredible. What a fun little getaway! We sometimes drive down to the Texas coast for a few days. We just got back last week from one. Isn’t it great to live near the coast? We have been to the NC mountains and the NC beach (twice) already this summer. It’s great to live near so much…. and it doesn’t hurt that Jacksonville is only 6 hours away. That really looks like a fun trip. Did not know all these were there. Fun. Surprise! 🙂 I knew about the beach. I’ve been to lots of waterparks and zoos. The tiger exhibit got me though. That was a big surprise! I have not been to Jacksonville but the restaurants and the beach are definitely something to look forward to. I guess I should plan on going there soon; I could visit some of my relatives who are based in the US as well. I didn’t talk about it in this post, but Jacksonville is close to St. Augustine and other historical areas here in the US. It’s a great place to visit to learn our history! That looks fun! We’ve never been to Jacksonville. I would love to visit this one day. This looks like a great place to visit. I will add this to my bucketlist. If you’re anything like me, your bucket list is getting longer and longer. 🙂 t seems I add one, do one. Add two, do one. Add three, do one. EEK! There are so many great attractions in Jacksonville! That beach looks perfect. Czjai, From what I know of your little guy, he would have a blast at Adventure Landing! The lifeguards were great, especially with kids in his age group. Great place! I haven’t been to Jacksonville, Florida yet. I actually wouldn’t mind living in Florida. Both attractions sound like so much fun. It sounds like you and your daughter had a ton of fun too. We did. And somehow, we got cooler weather there than they guys did at home in North Carolina. It sure helped us enjoy Jacksonville in June. So wonderful! I love this kind of summertime fun – it makes memories that last forever. I’m planning on making some of those this summer too. Beautiful pictures. Thanks, Elizabeth. Enjoy the memory-making. Cherish the memories. It sounds like there is so much to do in Jacksonville! I love the beach photo-it’s beautiful! I love all the partnering there is between attractions. Also, the biscuit restaurant sounds like a must to me! Liz, I’m an “adopted” southern girl who moved to NC in 2001. I’ve learned a lot about biscuits these past 14 years. A good southern biscuit is worth every calorie! And, I think there’s a huge trend in family friendly cities of places working together to make them affordable. That’s a great thing! Jacksonville sounds like such a fun place for a family getaway. I have never been to that part of the state before, but I would love go. It’s nice. They still have vacation hot-spots, but nothing like you’ll encounter in Orlando. It’s got a lot to offer. The beach is beautiful! I will be writing another post specifically about the Zoo — one of the most beautiful I’ve ever visited! You should see the pics on Instagram!